From the streets to the runways, Stockholm Fashion Week has become a hotbed of cool. Delving into this Scandi world of style for Who What Wear is Lucy Williams, the über-blogger whose latest wardrobe, travel, beauty and lifestyle adventures can be found over at Fashion Me Now. The influencer touched down and took to the schedule armed with a camera and some seriously good outfits, and this is the result: a mix of some of our favourite things, like minimalist fashion and meatballs! Not to mention she highlighted the incredible Mango shoes everyone in our office has now bought. 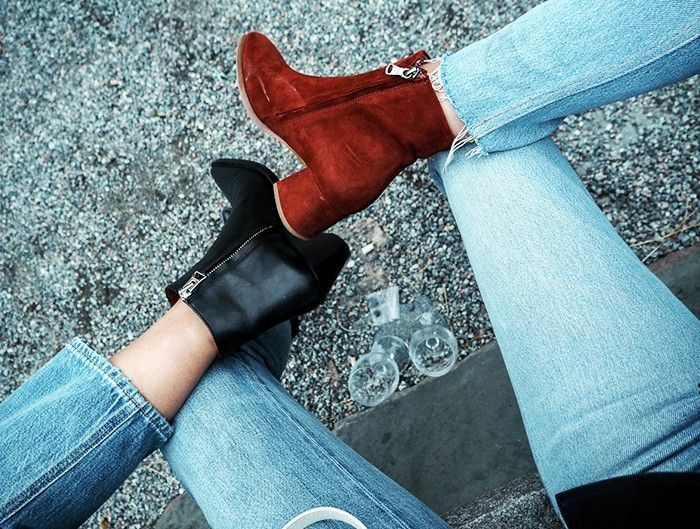 "Twinning with my partner in crime for the shows Shini of Park & Cube in our Filippa K and Acne boots respectively." "Visiting the Yung Lean and Sad Boys takeover of the Ann-Sofie Back store. While I am a real summer person, it felt kind of great to finally be able to wear cosy, new-season knits like this one from Filippa K again. " "My current love of baby pink looks like its here to stay at the Ida Klamborn show." "No trip to Stockholm is complete with meatballs and lingonberries. Think I might have found some of the best at Nytorget 6 in Sodermalm." "Classic Scandi minimalism at Stylein S/S 17." "Still not over fishnet socks. I teamed them with chunky heels and Re/Done jeans for the first day of shows." "The forever stylish Dagmar sisters invited us to their incredible home for lunch and a preview of their S/S 17 collection. Not sure what we were coveting more, the clothes or that stunning velvet sofa." "Inside the House of Dagmar." "Dagmar interiors and covetable clothes continued…"
"It'd be rude to not make a pitstop at Acne Studios." "Discovered a new favourite brand while out and about shopping. Felt very proud of myself that I didn't buy every single one of Rodebjer's knits, bouclé suits and silk kaftans." "Wearing my new Filippa K boots and Dodo Bar Or shirt for the ATP shoes presentation followed by dinner at Riche." "One of my favourite summer shoe brands, ATP Atelier held a hotel-room presentation with a theme of old-school Hollywood decadence with piles of their new sandals temptingly sprawled all over the bed." "Couldn't resist popping into my favourite Swedish brand Filippa K for some shopping between shows." "The Museum of Modern Art was the setting for some of the most innovative, creative shows I've seen including Amaze and Diana Orving. Loved the Yayoi Kusama–designed trees in and around the courtyard, which incidentally is the perfect spot for an evening beer!" "Why have models when you can have mesmerising ballet dancers walking and dancing en pointe down the catwalk? I could have watched the Diana Orving show all night…"
"Starting the day at Berns Hotel, our base for the week. Their cinnamon buns and coffee are always a treat." "Keeping it neutral and boyish in Mango jeans and Acne boots with the odd flash of gold for the final day of shows." "Vegan, Asian goodness at Story Hotel before visiting the jewellery lounge." "A brief interlude from the shows in Stockholm's old town, Gamla Stan." "The tailoring and colour palette at Whyred were definitely speaking my language. Start investing in anything mustard and prim, pleated skirts now." Shop our favourite Scandi brands here!